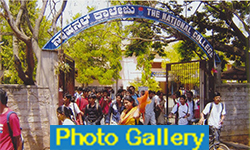 It is proposed to introduce an Add-on Certificate Course on ‘Gandhi and Social Development’ for the benefit of the students of the National College Jayanagar, Bangalore-70, with the whole hearted support and good will of its management- The National Education Society of Karnataka (R),Bangalore-04. Mahatma Gandhi, the leader of the Indian independence movement, venerated today as the “father of the nation,” can be viewed from many different angles – there is Gandhi the nationalist; there is Gandhi the politician; there is Gandhi the prophet of non-violence; and then, there is the Gandhi of Hind Swaraj, the repudiator of modernity and technology and “Western-style” industrial development. One of the greatest figures of the twentieth century, and perhaps of the millennium, Mohandas Karamchand Gandhi was born in Gujarat on October 2nd, 1869, and was assassinated January 30th, 1948. Gandhi declared that “Action is my domain”, so it is necessary to study the details of his life to begin to form a clear picture of his Leadership. The start point is also the end – he was called both “Mahatma”, meaning great soul, and “Bapu”, meaning Father. He was both of those things, not only to his native India, but also to millions of people around the world. Gandhian approach has always said about the voluntary wants, the need for self-sufficient village communities and the issues relating to better balance between man and nature. Gandhi wanted to have an ideal society of his own imagination and his economic ideas are a part and parcel of his philosophical and sociological ideas. He was interested in the growth of human beings and more significantly the growth of the deprived and underprivileged group of people. He was, in fact, the supporter of the maximization of social welfare and he had a belief that the growth of an economy is relied on the development of the totality of human personality. Gandhi pleaded for the humanization of knowledge for immunization against the ideas of distrust among the communities of the nations and the nationalities of the world. He wanted to take the country from areas of hostility into areas of harmony of faiths through tolerance, so that we could work towards understanding each other. His mass contact programme was specifically aimed at generating a climate of confidence and competition and eliminating misgiving and misconceptions, conflicts and confrontation. Gandhi also held that bridging the gulf between the well off and the rest was as essential for national integration as inter-religious record. He said that we must work for economic equality and social justice, which would remove the ills caused by distress and bitterness. The name of Mahatma Gandhi transcends the bounds of race, religion and nation- states, and has emerged as the prophetic voice of the 21st century. He is remembered for his passionate adherence to the practice of non-violence and his supreme humanism. After the great Buddha and Jesus, he once again demonstrated that non-violence could also be effective instruments of social change. Gandhi too talked of globalization but in a positive manner. His uniqueness did not lie in the fact that he was extraordinary but in his being extraordinarily ordinary and this simplicity of his was reflected in his thoughts too. His idea of swadeshi which talks of “production for neighbors” if applied to the world at large with his theory of “antyodaya” or “the last man” which speaks of providing every individual with the basic necessities can negate the effects of globalization by ensuring everyone fruits of developmental process. It is our firm conviction that, the Weapon of “satya”, “ahimsa” and “compassion” comes into play and helps in restoring the light to the darkening world. Hence, there is a great need to acquaint the teachers and students, with his thinking and work and involve them in studies, research and extension services for constructive work. Gandhiji’s ideas are desired to be applied to the reconstruction of human society on moral, ethical, non-violent and spiritual foundations. To promote awareness of the principles of Gandhiji’s philosophy for the sustained development of society. To inculcate ethical values propagated by Gandhiji for a healthy growth of personality of the student. Six Months – July To December consisting of 30 hours of Class room teaching, Guest lectures by eminent scholars, Audio-visual presentations and 30 hours of Field visits & Social Service. Field Work and Final Examination in the month of December. Note: Notwithstanding the above, the chairperson has the power to alter the things.